Blueberry Muffins are a mainstay in this house. There’s nothing better than a warm homemade blueberry muffin slathered with salted butter. Make sure you let the butter melt a bit before taking a bite. Mmm! 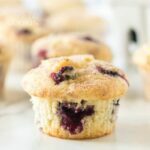 While I adore this blueberry breakfast cake in the morning, blueberry muffins are portable and easy to eat on the go! I am not against making things from a box. But in the case of blueberry muffins, they have to be from scratch! This muffin recipe is easy to put together and worth the little bit of extra effort you’ll put forth. Each delicious muffin is bursting with beautiful blueberries and ready for you to enjoy. 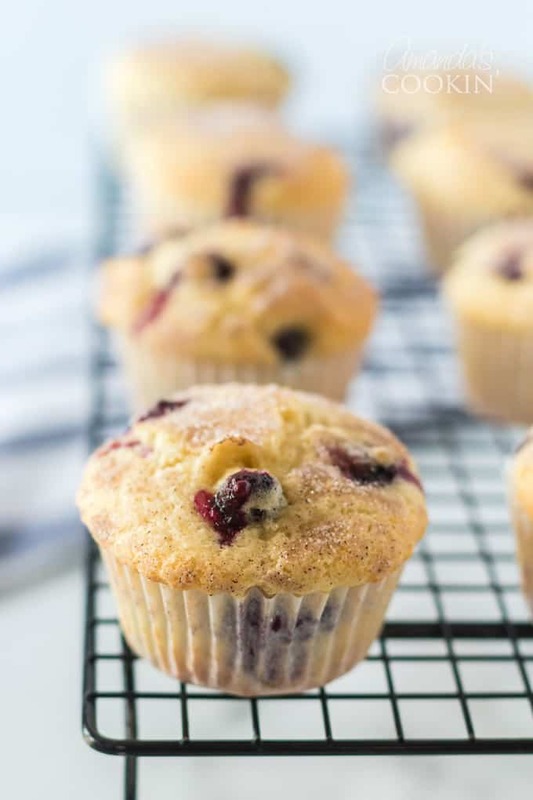 This recipe makes 12 blueberry muffins, so there’s plenty for everyone. Have one for breakfast, pack them into lunch boxes or enjoy with coffee as an afternoon treat. All purpose flour – For best results use regular all-purpose flour. Any substitutions will change the science of the recipe and I cannot guarantee the results. Even choosing a whole wheat flour can change the consistency, so it’s best to stick with all-purpose. Granulated sugar – This is regular white sugar, not powdered or confectioners’ sugar. 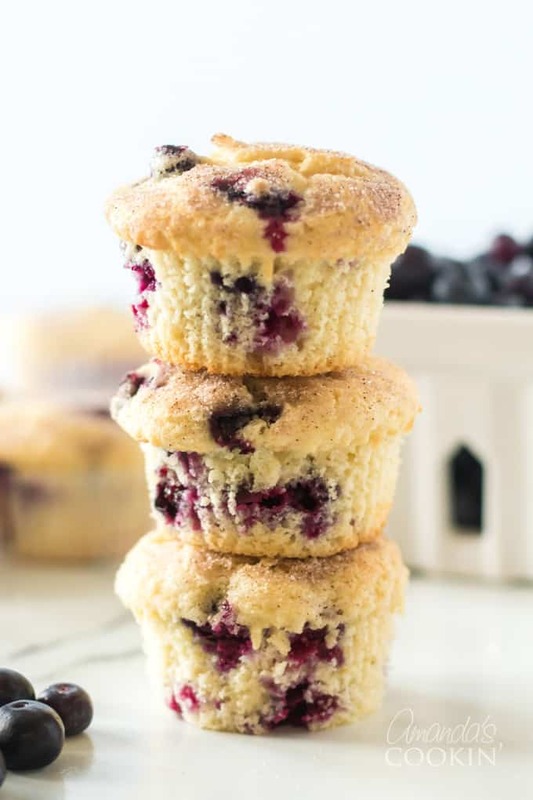 Some blueberry muffins include brown sugar as well, though ours does not. Table salt – Please use regular table salt for this recipe. Sea salt, Kosher salt and other variations of salt have different sized granules and will measure differently. A teaspoon of Kosher salt is not the same as a teaspoon of table salt. Baking powder – This helps your muffins rise, please do not leave it out! Make sure you use baking powder, not baking soda. These two items serve different purposes in baking. Unsalted butter – When baking I always use unsalted butter. You can substitute with salted butter if that’s all you have on hand, and margarine is acceptable as well. For this recipe you will melt the butter and let it cool a bit. 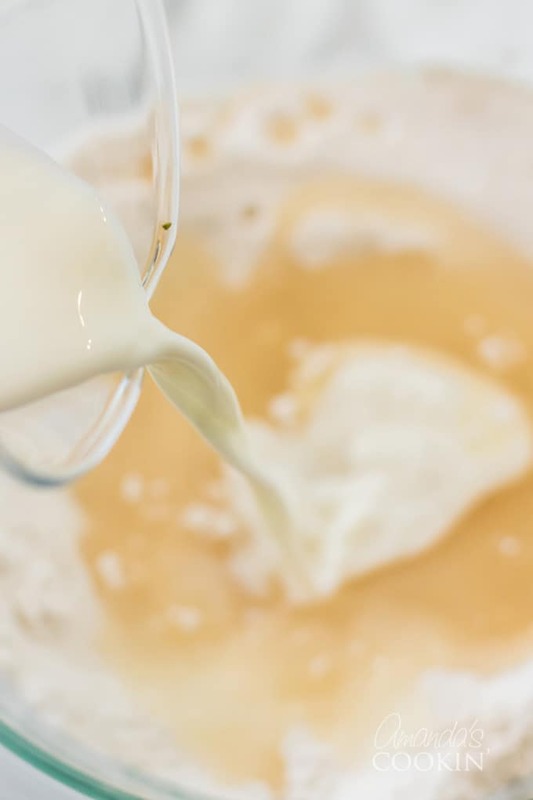 Milk – This recipe was made with whole cow’s milk. You can use 2%, 1% or skim if you are concerned about the amount of fat. We have not tested this recipe with any other variety of milk. Vanilla extract – I highly recommend pure vanilla extract for baking. The flavor is superior and does not have that overly sweet taste that imitation vanilla has. 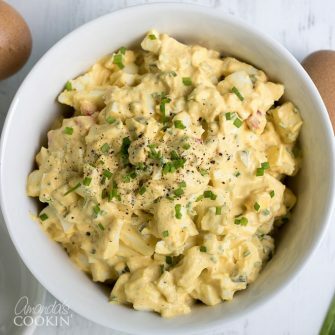 Egg – I use farm fresh brown eggs, but any chicken eggs are completely fine! Fresh blueberries – If you don’t have access to fresh blueberries, you can absolutely substitute frozen blueberries. If you do use frozen berries, do not thaw them first. Simply add them in their frozen state. 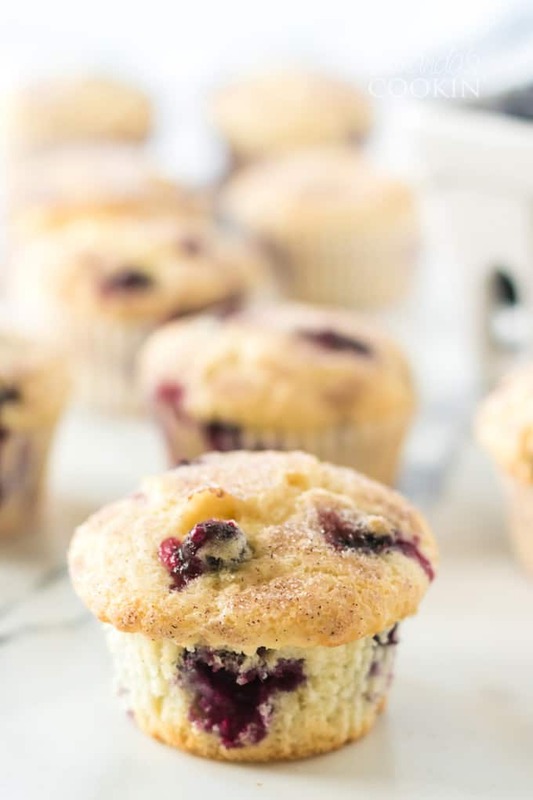 Cinnamon – This common spice is combined with some sugar to sprinkle on top of your delicious blueberry muffins! We prefer cinnamon sugar on top of the muffin instead of the common crumb topping. 1. Get started by preheating your oven to 400 degrees. 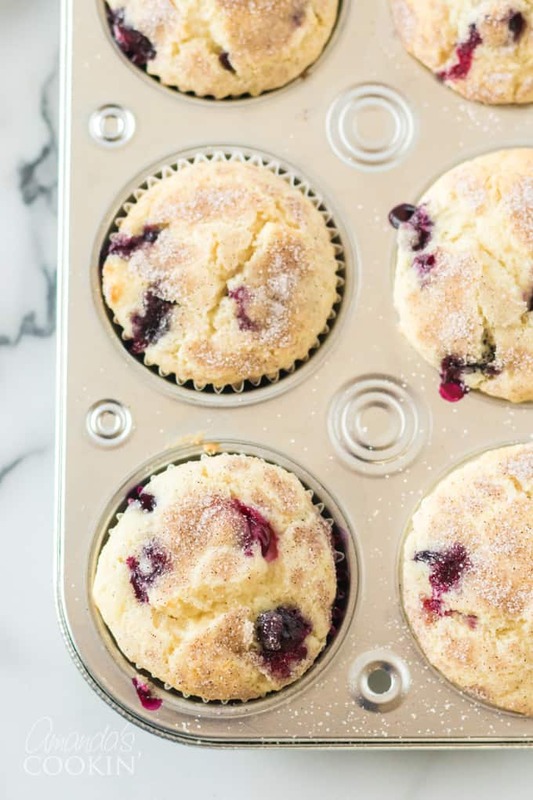 Line a 12-cup muffin pan with paper liners and set aside. If you don’t have paper liners, be sure to prep the muffin tin with cooking spray first. 2. 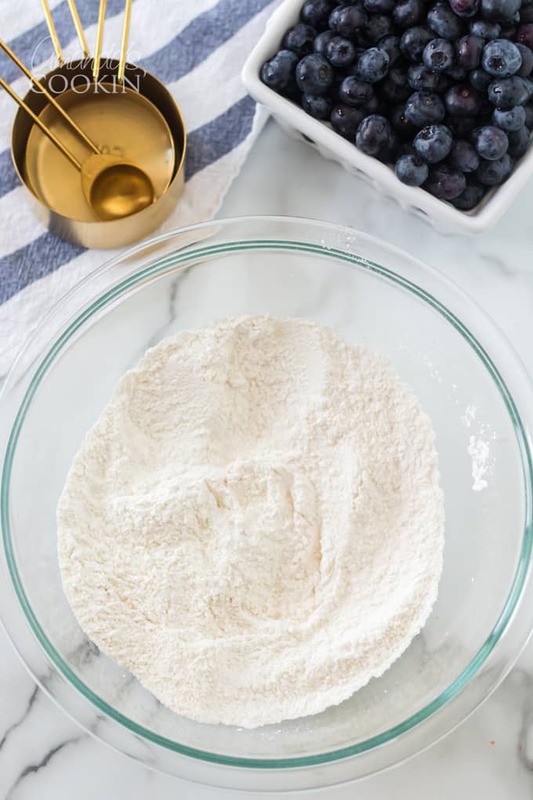 Using a fork or a whisk stir together the flour, sugar, salt, and baking powder. 3. 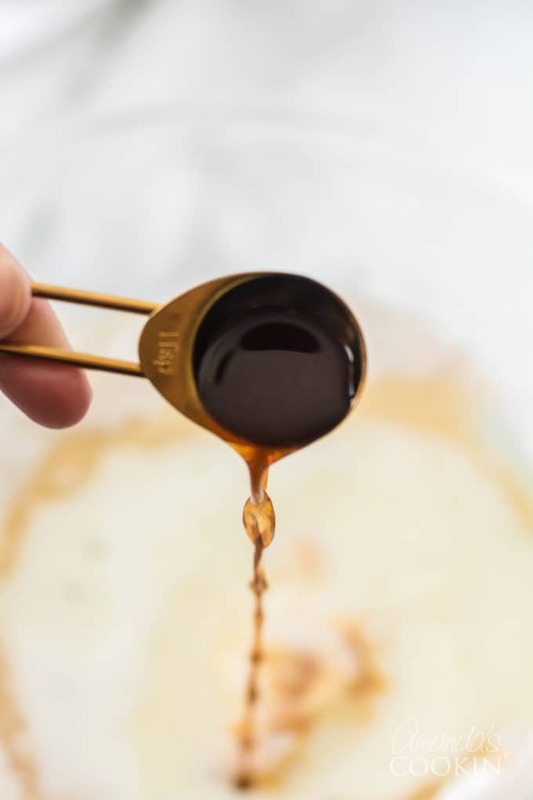 Mix in the melted, cooled butter, milk, egg, and vanilla extract. Stir the wet ingredients into the dry ingredients until they are just combined. You never want to over mix a quick bread of muffin batter. Keep in mind the batter will be thick and may be lumpy, that’s totally normal. 4. Next, fold in the blueberries until they are evenly distributed. If you are using frozen berries, be careful not to stir too long or your batter may end up tinted blue! 5. 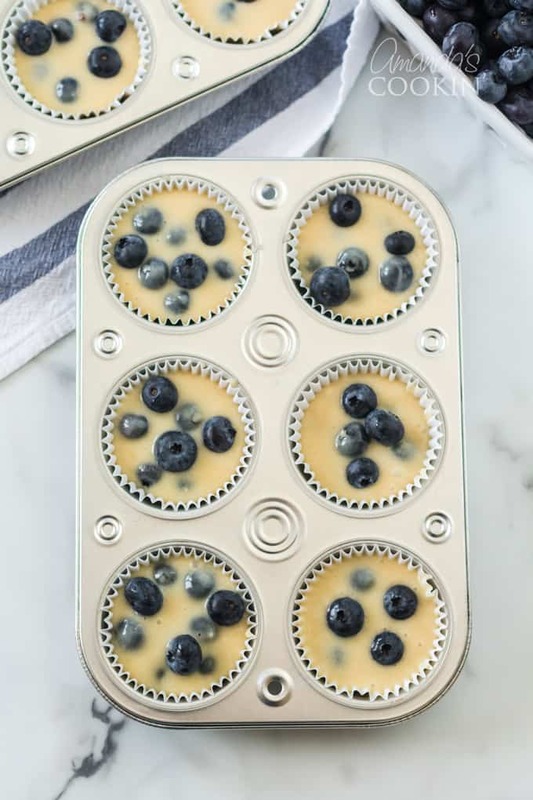 Distribute the batter evenly among 12 muffin cups. We use an ice cream scoop for easy measuring! In a small bowl mix together some sugar and cinnamon then sprinkle evenly over the top of the 12 muffins. 7. Bake the muffins in the preheated oven for 20 to 25 minutes, or until golden brown. A toothpick inserted into the center of a muffin should come out clean. You can certainly eat your muffins however you like! The muffin top is my favorite part, so I always slice that off first. Saving the top for last, I spread some softened salted butter on both cut sides and enjoy with a fork! Of course, diving right in, peeling the paper lining off as you go works too. I have a friend who breaks her muffin into pieces in a small bowl and adds in some fresh milk! 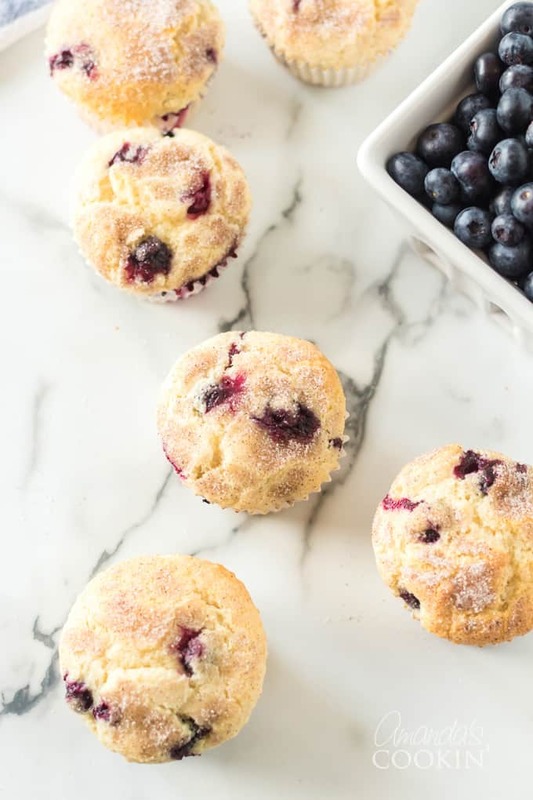 No matter how you eat your blueberry muffin, the most important part is that you enjoy every single bite. Our Blueberry Cobbler is packed with fresh, blueberries and topped with a crisp, biscuit layer. Blueberry Lush is a (nearly) no-bake blueberry layered dessert sure to delight everyone who tries it! This Lemon Blueberry Galette is a rustic and simple take on pie that’s just as delicious as it is easy. 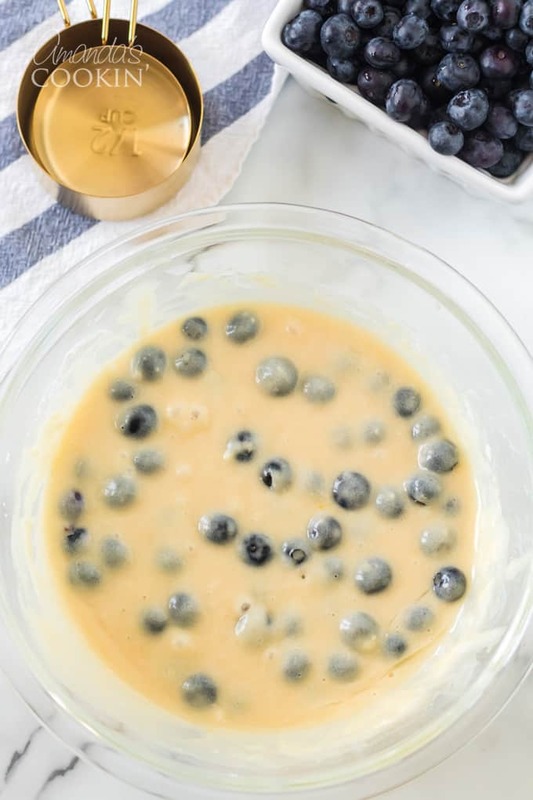 Lemon Blueberry Trifle is filled with fresh, juicy blueberries and bright, tart lemon pudding. Together they combine in a stunning dessert that will wow your guests. There's nothing better than a warm homemade blueberry muffin slathered with salted butter. Make sure you let the butter melt a bit before taking a bite. Mmm! Preheat oven to 400 degrees F. Line muffin pan with paper liners or spray with cooking spray. Whisk together flour, sugar, salt, and baking powder. Stir in butter, milk, egg, and vanilla. Stir until ingredients are just combined. Do not over mix, batter will be thick and may be lumpy. Fold in blueberries until they are evenly distributed. Distribute batter evenly among 12 muffin cups. In a small bowl mix together sugar and cinnamon. Sprinkle mixture evenly over 12 muffins.